If you’ve followed the media closely over the weekend you could quickly assume that the football world has become unhinged and fallen off its axis. Every commentator had an opinion on different aspects of last weekend’s games. Front and centre was Brian Taylor on Friday night when he mused that on a fantastic night for footy why was one umpire throwing the ball up in the centre and the other two bouncing? That was all well and good, but it went for a whole quarter and BT then engaged fellow commentators, Ling and Carey. In the end it was if you can’t bounce why are you out there umpiring? When someone finally bothered to ask the bench, they found out that Matt Stevic had a hamstring twinge and couldn’t bounce if he wanted to stay out there umpiring. Apologies came profusely from BT when he found the reason. My question was why was it even considered relevant commentary in the game? Commentators wondered why Dean Margetts threw the ball up after St Kilda was given a warning for a breach of the 6-6-6 rule with 8 seconds to go in the game against Fremantle. They decided he had used good common sense because if the bounce had to be recalled a further 2 seconds would have been eroded off the clock. Where were they when the media was briefed about the process and what have they been watching since the JLT series began? What Dean did was correct according to the process that was implemented. Lastly but most concerning was Patrick Dangerfield’s rant on twitter during the Collingwood v WCE match regarding the contact below the knee interpretation calling the decision “disgraceful.” Like many players and commentators do, they agree or disagree with the intent of the law. However, their commentary should also display a sense of fair play because the umpire got it right according to the laws of the game. 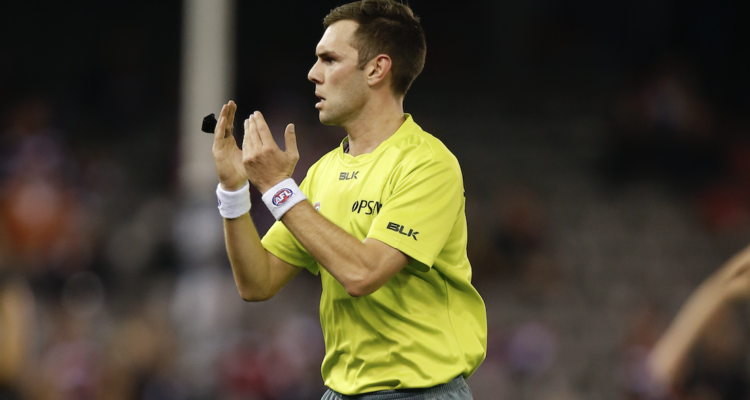 Field umpire Mat Nicholls returned to umpiring on the weekend at Frankston in the VFL. “It’s been many many years since I’ve been down to Frankston,” exclaimed Mat when I asked how he had pulled up in his first full game for the season. He went on to say, “and nothing has changed one bit!” I can only assume that the people on the hill under the time clock were still in fine voice Mat? Boundary umpire, Dillon Tee has been on the injured list since late last year with a groin complaint. I spoke to him yesterday after he underwent his second series of scans. “I seem to take two steps forward and one step back. It’s pretty frustrating at the moment!” Dillon was hopeful of returning in round one but is now unsure when he will be back on field. Get well and get fit Dillon. Brett Rosebury moves to equal 4th place on the all-time field umpire games umpired with Stephen McBurney on 401 games. What a remarkable effort for a very fine umpire! Field umpire Brent Wallace will be walking on egg shells this week until he walks out onto the SCG this Thursday night. 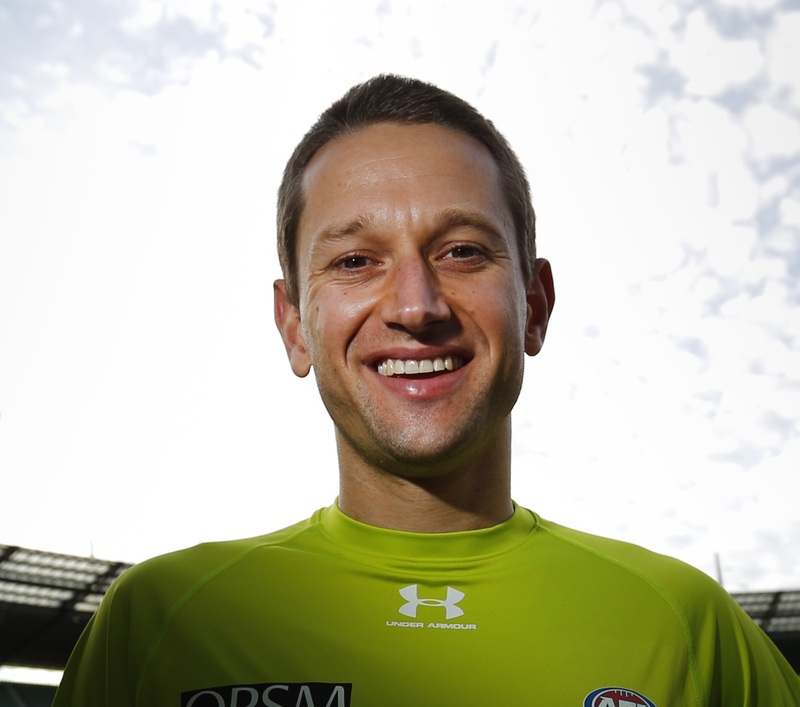 Brent will officiate in his 50th AFL game. Brent who is into his 5th season on the list has been beset by calf injuries over the course of his AFL career which included only 10 games last season. Fingers crossed Brent.